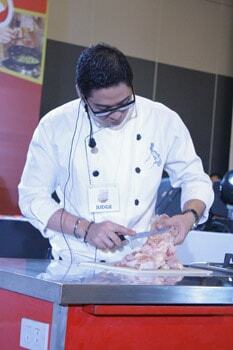 Executive chef and renowned food stylist Eugene Raymundo was impressed after using the Masflex KitchenPro 6″ Boning Knife in his deboning tutorial in the 2014 Umami Culinary Challenge held at SMX, SM Mall of Asia last January 28. The Ajinomoto sponsored event gathered around 400 Culinary and Nutrition students from 51 schools all over Luzon in a competitive demonstration of skills in healthy cooking. Along with other event highlights include new and unique culinary competition categories, Eat Well, Live Well, Umami & MSG Safety Presentation and Cooking Class facilitated by well known celebrity Chefs including Chef Eugene who showed the step by step process of deboning a chicken. “I like the Boning Knife. It’s not the typical knife na magaan because I prefer heavy knives. The weight of the handle and blade really helps when you use it in deboning.. tama lang kaya mas makokontrol mo siya. That’s why I like it.”, Chef Eugene stated after his deboning tutorial. Chef Eugene is executive chef of Five Cows Ice Cream Bar & resto and My Yellow Kitchen. He is also a food stylist and senior chef consultant for food manufacturers, restaurants and hotels. 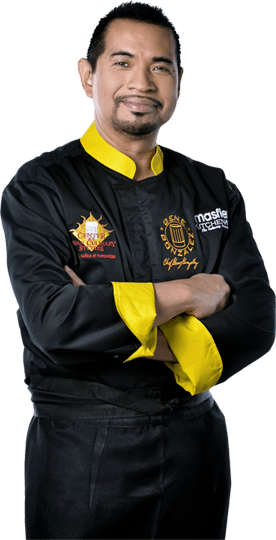 He also joined the Board of Judges in the said event with culinary and nutrition experts like Chef Sau del Rosario, Chef Seiji Kamura, Chef James Antolin, Dr. Zenaida Narciso and Joan Sumpio to name a few. In the end, University of Sto. Tomas brought the Umami Bowl Championship award with a kitchen classroom showcase as prize. Masflex KitchenPro was a major sponsor of this event.